Quincredible decides to do a little training to better utilize his new found invulnerability. He enlists his next door neighbor Mr. C to help. Little does Quinton know that his neighbor has a training regimen to end all training regimens. One that Quincredible may not survive! Much like the first issue, this plot of this comic can pretty much be summed up in one sentence. An old man helps Quinton train to use his powers. That it. It starts with the training session about to begin, and ends with it finished. Now despite that how bare that sounds, this story (called “Training Day,” naturally) is actually pretty darn good. 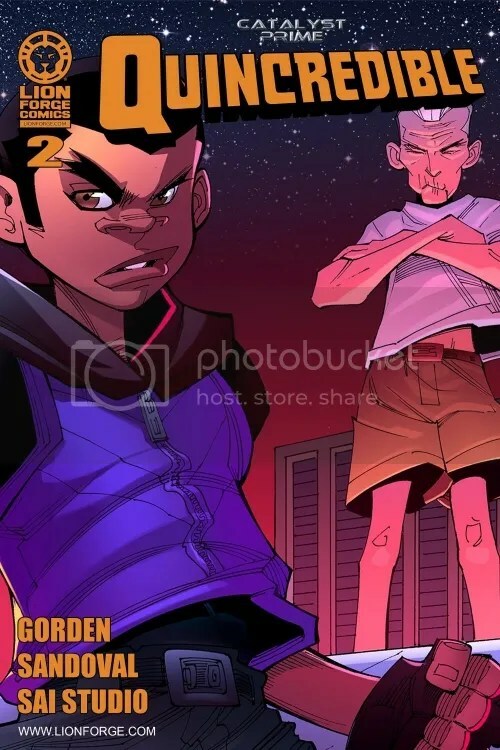 The two (& only two) characters in this book are Quinton and his neighbor, an old man he calls Mr. C. Mr. C wasn’t very impressed with Quinton’s performance against Big Brother last issue (frankly, neither was I), and has taken it upon himself to help Quinton get better. He sets up a fake hostage situation in a nearby building, using mannequin’s for the hostages, and has Quinton attempt to rescue them, and then they go out to a park to work on Quinton’s speed and hand-to-hand combat skills. Through the issue, through the running dialog, Quinton clearly respects Mr. C, although he thinks the old man is a little bit nuts. Mr. C, who repeated refers to Quinton by the names of other famous Black superheroes, appears to have a mysterious background himself, referring to his time at his “old company” (could that be a hint to the C.I.A.? Just speculating). So it’s a short, but entertaining story. I will have to deduct a point for a couple of illogical premises (yes, even for a comic-book dealing with a teenage superhero). The training session starts on top of building in the middle of the city, surrounded by a bunch of high-rises, where any number of people could watching. And Mr. C sets off a series of bombs to distract Quinton, right in the middle of the city. That’s the kinda thing that should attract a considerable amount of attention from the local authorities. But the fact that I didn’t even consider such things until after I’d finished the story shows how well-written this was. I was too busy just enjoying it as I read it. So writer David Gorden accomplished his mission here, I’d say.